With Halloween comes the Mad King Thorn! I always look forward to playing the Mad King’s games even though it’s the only day out of the year I usually play Guild Wars. I love the decorations and his model, I love his games, I love his corny jokes, and I love getting a new mask. Unfortunately, ArenaNet changed things a bit this year. Instead of rewarding a mask at the end the event, they gave players a single-use tonic that turned them into a miniature Mad King Thorn. Completing a quest gives a token that can be used to purchase a mask from a previous year. That’s all fine and great, but I want a new mask! I bet ArenaNet did this to focus their attention on Guild Wars 2, but I think that’s a mistake. ArenaNet would like me to pull away a bit from WoW and play Guild Wars 2, I’m sure. 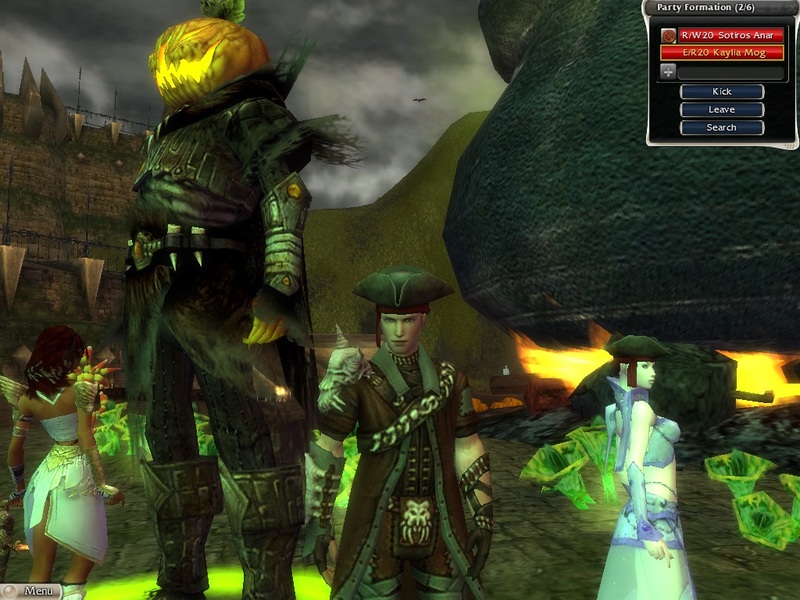 Right now, my only tie to the Guild Wars series at all is playing the original Guild Wars on Halloween. Yes, it’s true that I played despite knowing ahead of time that there was no new mask, so maybe they still have me. However, I’m a lot less thrilled about it. You’d think they’d step it up and put in an event even more fun to remind people how great ArenaNet and Guild Wars are. That might help me to play Guild Wars 2. In better news, Mad King Thorn chose me to battle him in rock-paper-scissors! I think it was the first time I’ve been chosen. Of course, I was going back and forth between two computers while multiboxing. It was the first round, and I had done my emote too early by accident. He killed me. But maybe I’ll get my chance to best him next year (if I continue my tradition of playing). My disappointment at failing my battle against him and the lack of a new hat didn’t stop Mooglegem Kaylia Mog and I from boogying down with him though! Here’s one of the jokes that I like. What’s the difference between someone who doesn’t laugh at my jokes and a corpse? I don’t know the exact phrasing of this one, and when I searched online, I couldn’t find it. Maybe it’s new. Do you know why I used dwarf labor to build a statue in my honor when I was alive? Because dwarves have low overhead! To which, I replied, “A thousand pardons, fine citizen, I cannot hear you. I HAVE A PUMPKIN ON MY HEAD!” HA HA HA HA HA!